He's been compared to Gareth Bale, fast-tracked into the national squad, and was linked with a transfer to some of the top clubs in Europe before becoming the most expensive ever Scottish player - all after only 13 starts for his club. But, swift of foot and imposing in stature, Oliver Burke is not only far from your stereotypical winger, he is no ordinary 19-year-old footballer. He became a fixture in new Nottingham Forest head coach Philippe Montanier's starting line-up this season, repaying the Frenchman with four goals. Now, days before vying to win his third Scotland cap after being included in Gordon Strachan's squad for Sunday's opening World Cup qualifier in Malta, Burke has switched to the German Bundesliga after RB Leipzig paid the English Championship club £13m for his services. Here's five things you should know about the teenager tipped to be the football superstar for which Scotland has long been yearning. Born in Kirkcaldy on 7 April 1997, Burke was brought up in England and joined Nottingham Forest's youth academy at the age of eight. He signed a professional contract shortly before being handed his first-team debut by Stuart Pearce as a late substitute in a 3-1 Capital One Cup defeat by Tottenham Hotspur on 24 September 2014. A one-month loan to Bradford City was to follow and two outings in English League One defeats contributed to an inauspicious start to his career. However, on his return to Forest, he gradually established himself as a fixture in the Championship club's first-team squad under fellow Scot Dougie Freedman last season. With his bulging thighs and broad shoulders holding up a 6ft 2in frame, Burke would not look out of place among the bulked-up wingers who these days grace the fields of top-class rugby union. And, by the time he scored his first Forest goal in December's 1-1 draw for Cardiff City, he had elbowed compatriot and namesake Chris Burke out of the picture at the City Ground. Burke the elder, the former Rangers, Cardiff City, Birmingham City and Scotland winger now on trial at Kilmarnock, was subsequently taking his more diminutive frame to Championship rivals Rotherham United on loan before being released at the end of the season. Burke had still featured more from the Forest bench - 18 out of 31 appearances - than the starting line-up, but that did not deter Strachan from calling him into the Scotland squad for the first time in March. Strachan has suggested it was a happy coincidence that Burke had impressed for Forest while the head coach was on a scouting mission to watch striker Tony Watt in action for Charlton Athletic. Some wingers beat their man with speed, some beat their man with trickery, some beat their man with power. In Burke, Strachan, himself a renowned winger of old, saw a player who "offered something different" and his brief cameo performance in the 1-0 friendly win over Denmark confirmed him as someone who combined all those qualities in one handy package. A couple of lung-busting runs quickly justified Strachan's decision to by-pass the under-21 set-up for the teenager who had already played six times for the Under-19s. As summer debate raged about why Wales were able to reach the Euro 2016 semi-finals while Scotland failed even to qualify, much was said about the importance of a Gareth Bale-style talisman in transforming a workmanlike international team into a good one. Some are predicting that Burke could be the next Scot to follow the likes of Kenny Dalglish and Denis Law by reaching such world-class status. 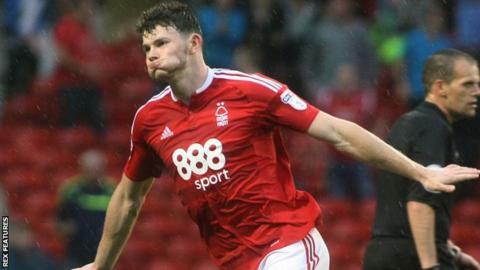 After the winger's recent pair of goals against Wigan Athletic, Forest team-mate Thomas Lam compared Burke in style and physique to Bale. "He is a great talent and potentially a great player," said the Finland defender. "He is a similar player to Gareth Bale. I do not want to say he is definitely going to be as good as him, but you can see the similarities there - he does scare the life out of opponents." As the summer transfer window approached closure, Burke was being linked with Arsenal, Barcelona, Bayern Munich, Crystal Palace, Leicester City, Manchester United, Sunderland and Tottenham Hotspur. However, Leipzig emerged out of left field to beat their Bundesliga and Premier League rivals to his signature. Forest head coach Montanier had insisted that the teenager, who signed a new contract until summer 2021 in February, ought to remain at the City Ground for at least another season to learn his trade. But, as owner Fawaz Al Hasawi defended the sale by stressing that the £13m would be used to invest in players to aid their promotion bid, Burke was joining a club whose own rapid rise up the ranks mirrors his own. Founded in 2009 when energy drink maker Red Bull purchased the rights of fifth-tier SSV Markranstadt, they won promotion last season as runners-up in the second tier. Ralph Hasenhutti was appointed head coach in May and the former Bayern striker inherited a squad full of emerging German talent that has been bolstered during the summer. Burke, who sporting director Ralf Rangnick described as "an outstanding talent with an awful lot of potential", becomes their second highest signing of the summer after Guinea midfielder Naby Keita, who arrived from sister club Red Bull Salzburg. The Scot said he was impressed by Leipzig's desire to become one of Europe's top clubs and together they could be on the fast-lane to the top.